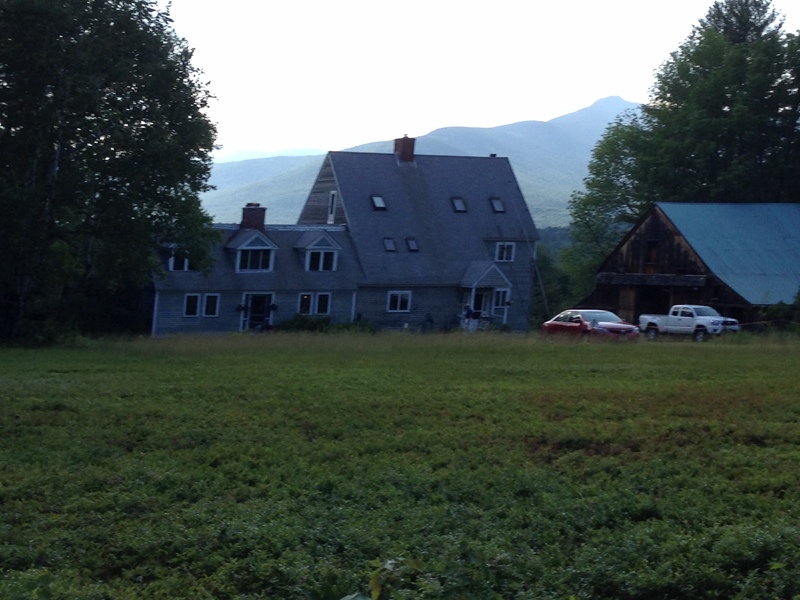 In 1997, Spring published Norman Friedman’s and David V. Forrest’s “Our Trip to Silver Lake,” a brief account (with many good photos) of the Cummings Society’s 1996 trip to New Hampshire to visit to Cummings’ summer home, Joy Farm. In this post, we chronicle a return visit nineteen years later, sponsored by the Friends of Madison Library (FOML). 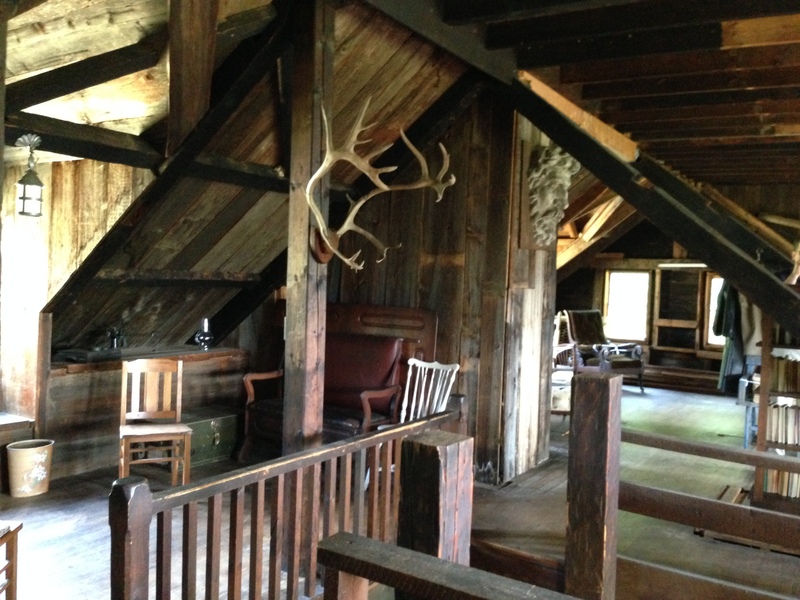 Besides visiting Joy Farm, we were able to make outdoor visits to “Abenaki,” the Cummings cottage on Silver Lake, as well as Ruth Shackford’s farm, old Mr. Lyman’s house and barn, Sam Ward’s house, and (almost) Hurricane Point. In addition, we spent a morning and part of an afternoon viewing the Cummings paintings and memorabilia collected at the Madison Historical Society Museum. The visitors from the Cummings Society were Gillian Huang-Tiller, her husband Ken Tiller, Steven Katz, and Michael Webster—five fewer in number than those who made the 1996 journey. Our hosts were numerous, and generous with their time, advice, performances, and conversation. Chief among them are Susan Lee (Madison Library), Peter and Joyce Stevens, Peter and Becky Mattison (Joy Farm), Ann and David Wilkins (Madison Historical Society), Carol Batchelder, Ruth Shackford, and her son, Jesse Shackford, III. Early Friday afternoon, Joyce Stevens and her husband Peter led a group consisting of David and Ann Wilkins, Gillian Huang-Tiller, Ken Tiller, and Michael Webster up a rutted two track path through the woods to “Abenaki,” the house that the Reverend Edward Cummings and Sam Ward built on Silver Lake, with a view of Mount Chocorua. The property today is some 75 acres, but back then, Edward Cummings owned even more—almost the whole east side of the lake. 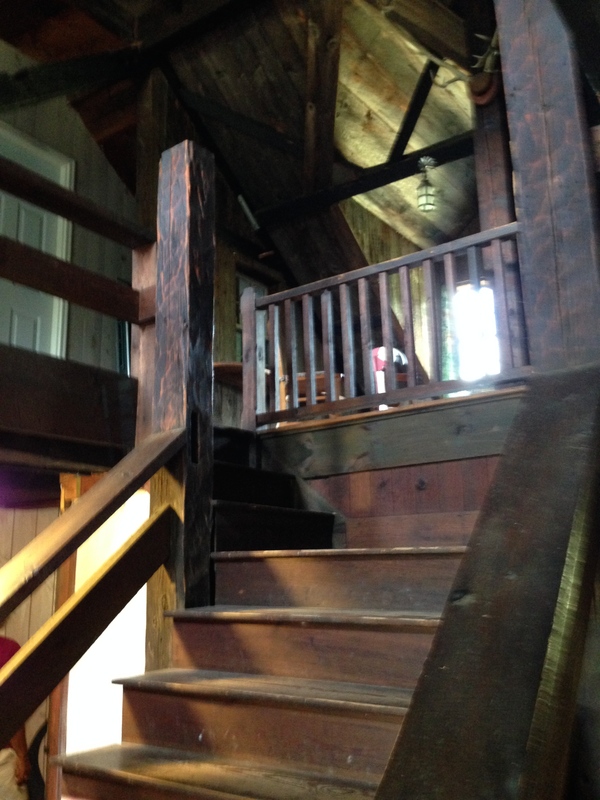 The house is three stories, plus a large livable attic space. Since the current owner had not yet opened for the season, we could only view the house from the outside. In the winter of 1909-1910, Sam Ward and others transported all the building materials for the house across the frozen lake via sledge. Cummings’ sister Elizabeth noted in her memoir that when the Cummings family arrived in the summer of 1910, “the cellar, walls, roof, and sides of the house were made, but there were only very rough floors, there were no windows in the window frames, and the stairs were not finished. My brother and I were delighted to be living by the lake and to be able to swim and go out in boats, and to help build our house. The whole family turned to and helped” (87). Later Friday afternoon we followed Joyce Stevens’ car up High Street and North Division Road to a turn-off on a kind of one-lane dirt logging road (what we in Michigan call a “two-track”) and bumped along through the dense woods for maybe a mile until we emerged in a clearing to see Joy Farm at the top of the hill. 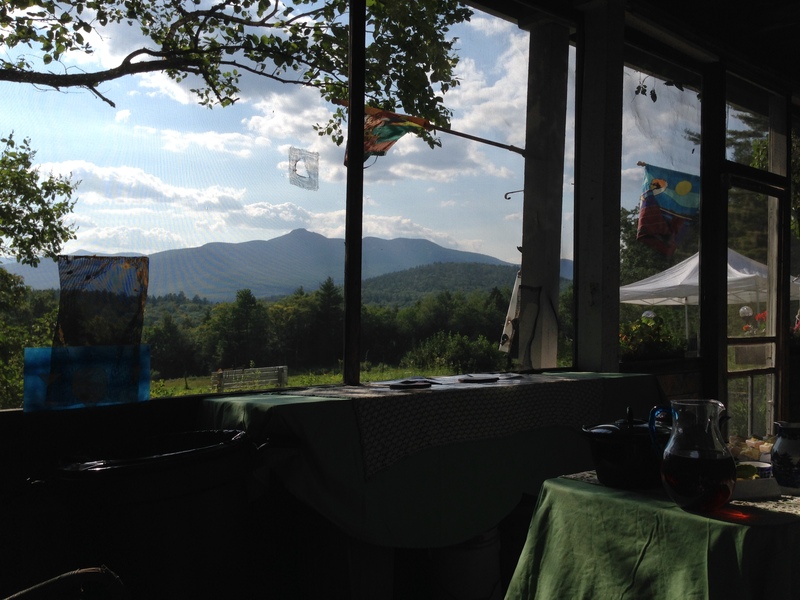 The current owners, Peter and Becky Mattison, hosted a marvelous tea for the visitors and locals, served on the first and second floor porches with a view of Mount Chocorua and the White Mountains. 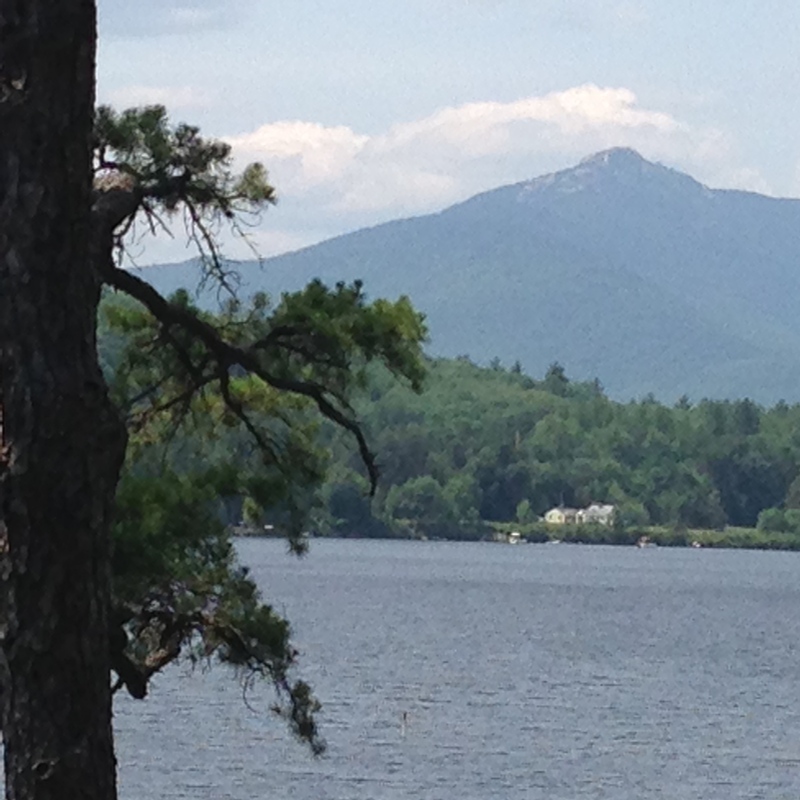 (By the way, the natives of Madison, NH and environs pronounce “Chocorua” like this: “Sho – KOR – u (oo) – wa”—with the accent on the second syllable.) 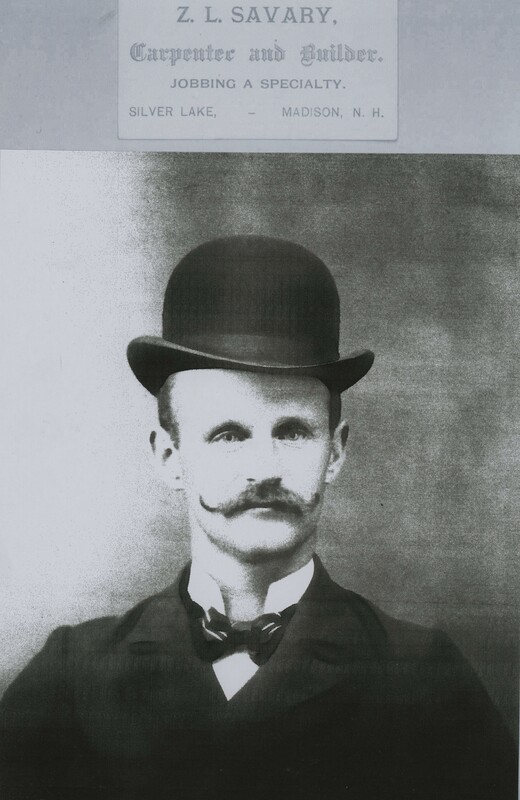 Joy Farm was bought in 1899 from one Ephraim Joy and refurbished and expanded by Cummings’ father, with extensive help from a local carpenter with the resonant name of Zantford Savary. 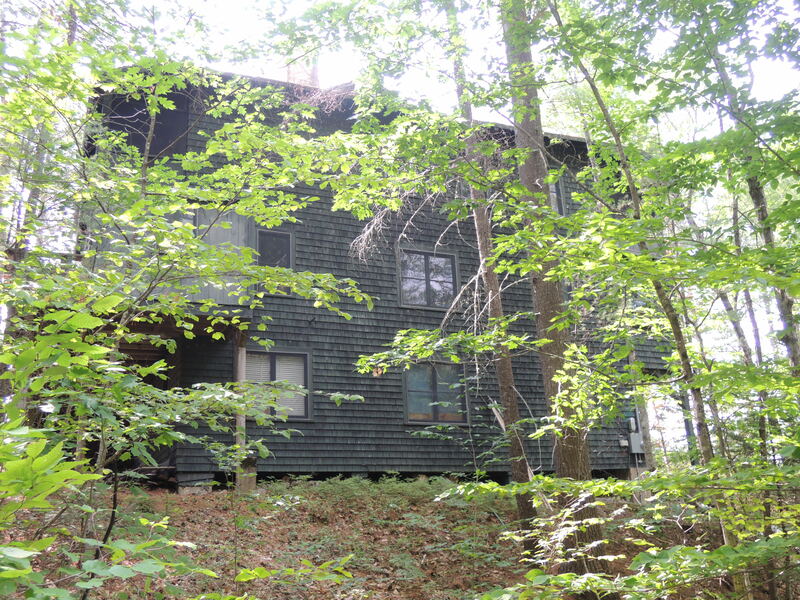 When my New Hampshire father bought what was variously known as the Hatch place or the Joy farm (after successive owners Hatch and Ephraim Joy) its primitive hilltop house faced a painfully made clearing. Not for nothing is New Hampshire nicknamed the Granite State; that clearing was ringed with gigantic rocks: boulders of all imaginable shapes yanked from the earth, year after year, by sweating men and horses. . . . All the ramshackle house’s crazy windows gave on to that clearing—not even a peephole graced the opposite side. [H]ad the back of the house contained a single aperture some Hatch or Joy might have found herself or himself confronted by some of the seven loveliest mountains in the world. . . . My father’s first deed was, by cutting windows and building a porch on the side toward the seven mountains, to turn his newly purchased house around without moving it. In the photo, we can clearly see the stairway to the flat roof between the first and second dormer windows. (All the dormer windows were also added by Edward Cummings.) As he did at Silver Lake some 10-15 years later, Cummings’ father sold or donated some of his large land holdings around Joy Farm. His brother John lived just north of Joy Farm, and in 1900, Edward gave ten acres of land just to the south to the Reverend Samuel Crothers, a fellow Unitarian minister. The “Crothers Croft” was also built by Zantford Savary. Cummings’ father opened up the interior of the house by removing some partitions and constructing a large open staircase in the middle of the house. The railings and risers on the staircase, as well as the shelves he built for books, are constructed of 2″ x 6″ boards. The extensive renovations and solid construction of the house are the marks of a confident man: the Reverend Edward Cummings was no meek little preacher. The stairway in particular reminds me of his son’s description of Picasso as a “Lumberman of The Distinct” chopping “hughest inherent / Trees of Ego” to “hew form truly” (CP 95). At the top of the stairs was very large (2-3 feet high) plaster bust of Zeus—a sort of unwearable mask. Downstairs there were many books on the shelves— almost all of them Edward’s or Rebecca’s. 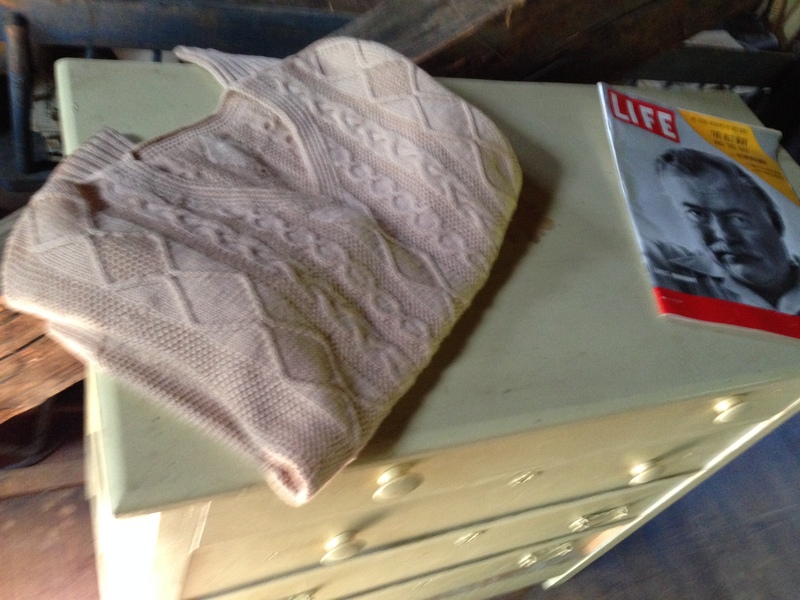 The Mattisons has set out many old magazines out on tables and chairs—some Outlook magazines circa 1903-1910, some fashion mags and New Yorkers from the ’30s and ’40s, a few Paris Matches from the ’40s and ’50s, and the 1953 LIFE magazine with the complete publication of Hemingway’s Old Man and the Sea. 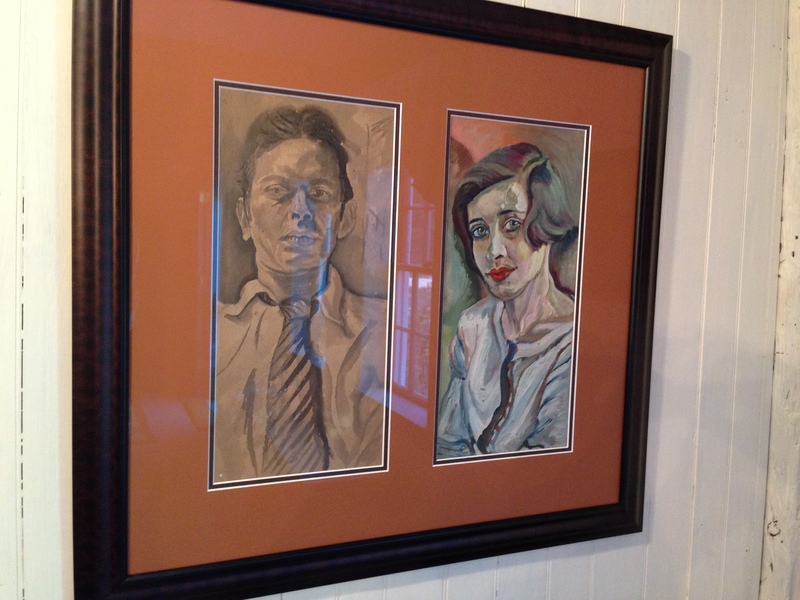 Cummings’ palettes were on display, as well as two quite good small portraits—one of himself and one of Anne. 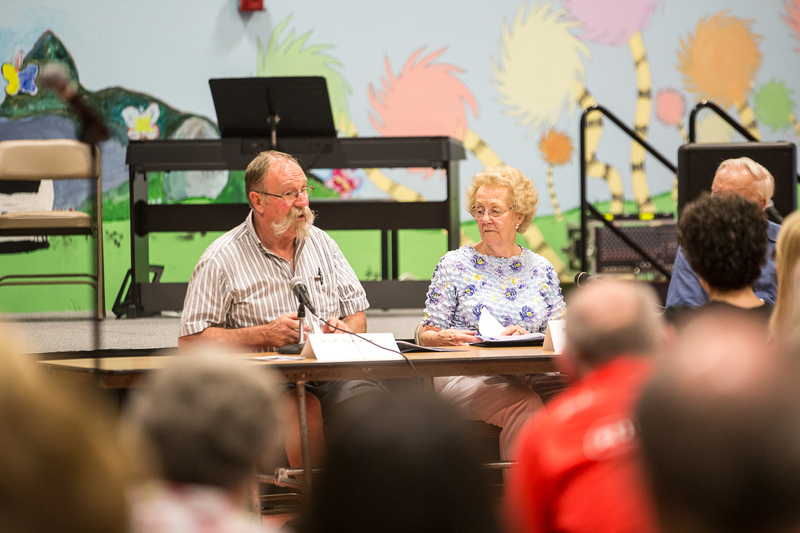 On Friday evening, the FOML presented a “Cummings at Silver Lake” program at Noyes Hall in the Madison School. David Wilkins began with a short nonlecture impersonation of E. E. Cummings, followed by Wilkins (as Cummings) and Peter Stevens (as his questioner) reading the short dialogue called “Foreword to an Exhibit: II” (Miscellany 316-317), which was followed by a reading of “A Poet’s Advice to Students” (Miscellany 335). Next, the Silver Lake Singers performed six musical versions of Cummings poems, including Vincent Persichetti’s setting of “purer than purest pure” (CP 601), Ellen Mandel’s setting of “when faces called flowers float out of the ground” (CP 665), and Dexter Harding’s setting of “I’m very fond of / black bean / soup” (CP 1023), performed on guitar by the composer himself. Jesse Shackford III and Ruth Shackford then read some of Cummings’ letters written to Ruth when she was caretaker of Joy Farm. (Excerpts from these letters may be read in Norman Friedman’s article in Spring 6.) The program concluded with a round table of reminiscences of Cummings and Marion by Jesse Shackford, Ruth Shackford, Henry Forrest, Linda Drew Smith, and Carol Batchelder. Jesse talked of the time when Marion called him to Joy Farm to help her after Cummings suffered the massive stroke that ended his life. Carol Batchelder spoke of how Cummings would stand by the memorial light looking out at the lake while Marion went to the post office or the store. (See Carol’s article in Spring 6, “Nobody-But-Himself.”) One can hear Ruth and Jesse Shackford discuss the Cummings they knew in this audio postcard from New Hampshire Public Radio. 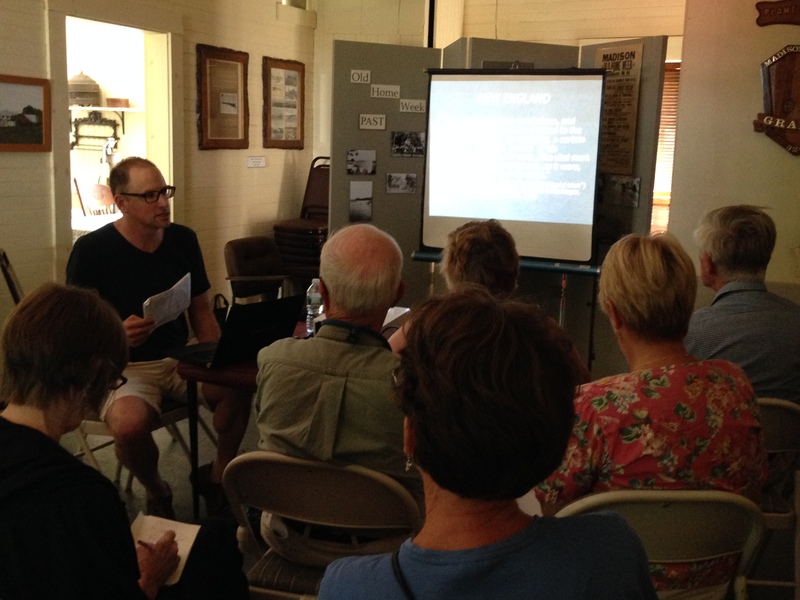 On Saturday at the Historical Society Museum, Steven Katz gave an excellent talk on Cummings’ art, concentrating on the Silver Lake / Joy Farm / Mt. 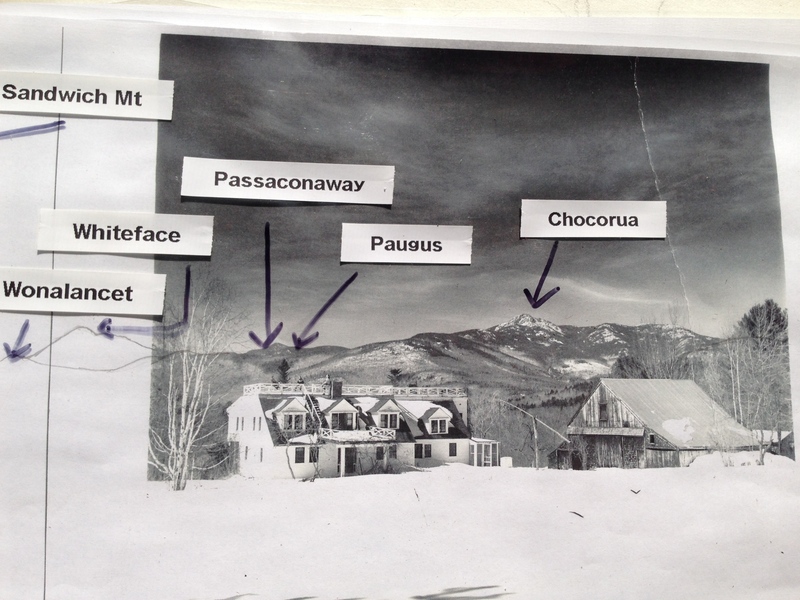 Chocorua works. 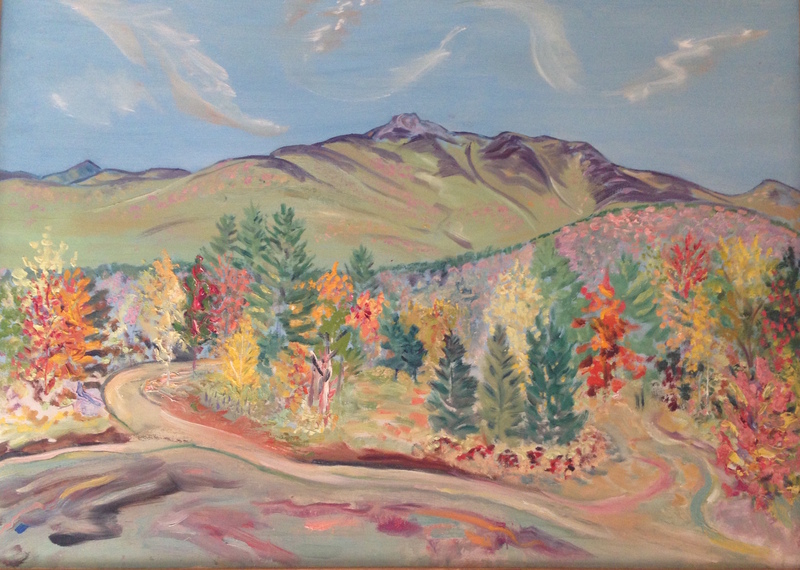 In the Museum gallery were several of Cummings’ oil sketches, as well as two fine landscapes of Mount Chocorua donated by Ruth Shackford. Also on display were early photos of Elizabeth and Estlin and their father, Elizabeth’s (quite large) doll, and a shield that the 10-year old Cummings made from the bottom or top of a sugar barrel. 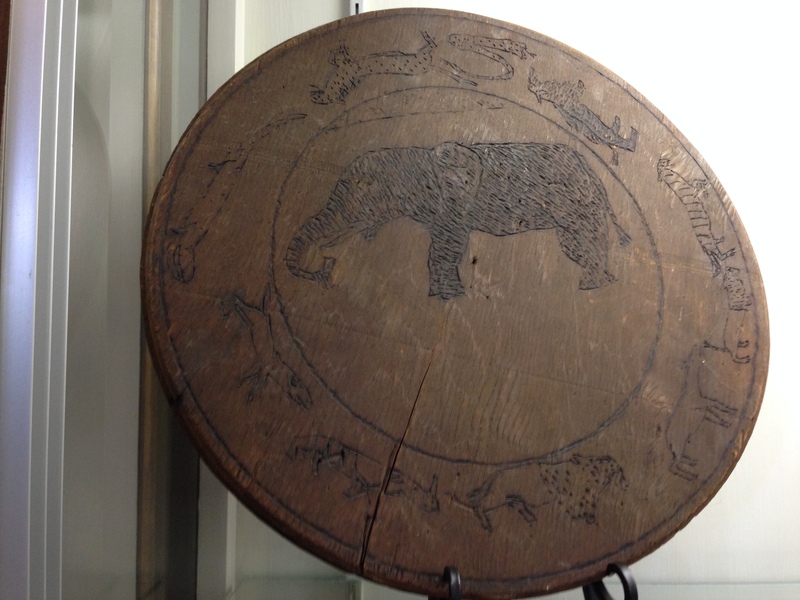 With his wood-burning kit, he incised in the middle of the shield his totem animal, an elephant. Around the edge of the shield “are 10 rather abstracted animals, including a goat, a snake, a tiger, a leopard, a dog, a rhinoceros, and an alligator or crocodile” (Wilkins). 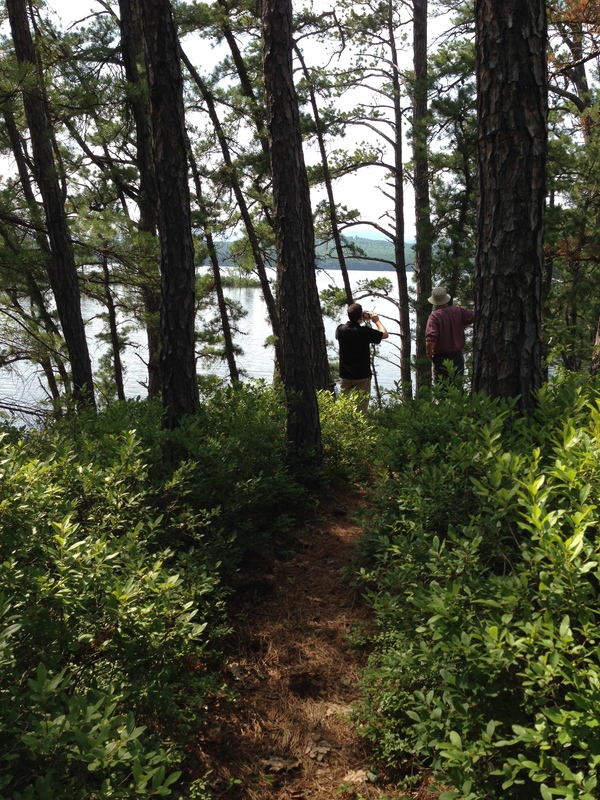 On Saturday afternoon, with the help of an excellent map provided by our hosts, we went on a self-guided tour of outdoor sights around Silver Lake. We drove first to the Depot, Post Office, and Memorial Lighthouse at the head of Silver Lake. Frank Lyman’s place is just down the road: Mr. Lyman would supply Cummings and Marion with fresh vegetables, and of course, he is the wise protagonist of “old mr ly” (CP 567). Another Cummings poem, “now comes the good rain farmers pray for(and” (CP 754), depicts Frank and his son Reg and daughter-in-law Lena standing in “the barn’s immense / doorway,” watching the rain fall. 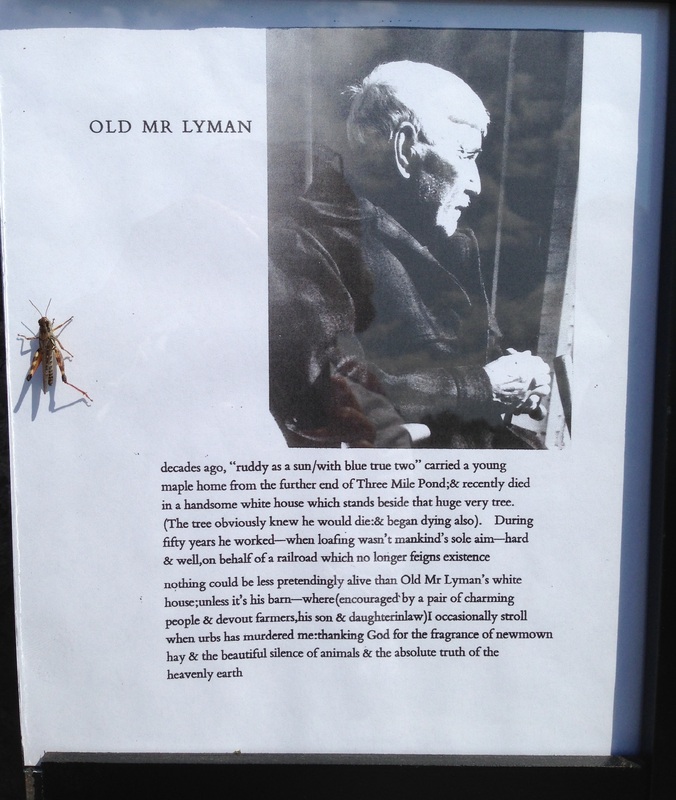 When we were there, the barn was filled with antiques, and outside was a small exhibit showing the photo of Mr. Lyman from Adventures in Value. A grasshopper alighted and Gillian snapped a photo. North of the Lyman place on High Street is Jess Shackford’s farm, while to the south on Plains Road on the west side of Silver Lake is Sam Ward’s farm. 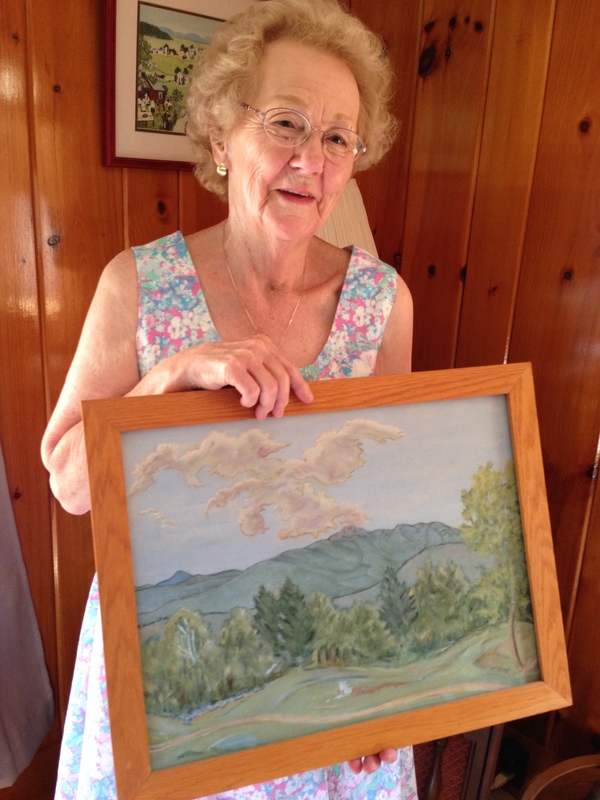 Ruth Shackford showed us a small landscape that Cummings painted, with a view of Mount Chocorua. At Sam Ward’s place, current owner Joyce Stevens had displayed on the porch some photos of Sam and his wife Mame, a composition board with Cummings’ elegy for Sam, “rain or hail” (CP 568), and copies of letters (from the Houghton Library) to and from Cummings and Sam. Our last stop was a visit to Hurricane Point Natural Area. 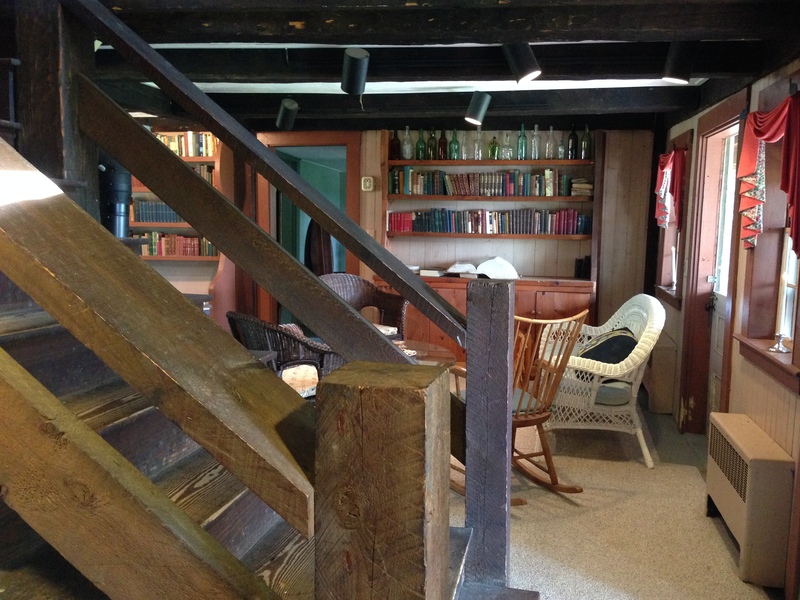 In the summer and autumn of 1920, Cummings finished writing the bulk of The Enormous Room at his tree house on the point. (He would paddle a canoe from Abenaki to the point, work all day, then paddle back for supper.) The Friends of Madison Library web site Cummings at Silver Lake notes that “Three pine stumps and a rotting trunk inclining down-slope toward the lake mark the site of the tree house.” Despite the excellent trail leading to the end of the point, Gillian, Ken, and I cravenly retreated after seeing masses of poison ivy lining the pathway. We missed the remnants, but the wonderful site reminded us that even while writing of his incarceration in a French prison camp, Cummings remained close to nature. Sam Ward is eulogized in Cummings’ poem “rain or hail”: “sam was a man / grinned his grin / done his chores / laid him down” (CP 568). Some photos of the tea at Joy Farm have been posted on the FOML Cummings at Silver Lake site. Batchelder Carol A. “Nobody-But-Himself.” Spring: The Journal of the E. E. Cummings Society 6 (1997): 26-44. Cummings, E. E. “Foreword to an Exhibit: II.” Memorial Gallery, Rochester, NY (May 1945). Rpt. in E. E. Cummings: A Miscellany Revised. Ed. George J. Firmage. New York: October House, 1965. 316-317. —. “A Poet’s Advice to Students” Ottawa Hills Spectator (26 Oct. 1955). Rpt. in E. E. Cummings: A Miscellany Revised. Ed. George J. Firmage. New York: October House, 1965. 335. Donahue, Molly. “Audio Postcard: A Celebration of E.E. Cummings.” Word of Mouth, New Hampshire Public Radio, 20 July 2015. Web and Radio. FOML. “E. E. Cummings at Silver Lake.” Madison, N.H.: Friends of Madison Library, 2015. Brochure. —. “Where did E. E. Cummings write The Enormous Room?” Cummings at Silver Lake, Friends of Madison Library, 31 May 2015. Web. —. “Tea at Joy Farm.” Cummings at Silver Lake, Friends of Madison Library, 16 July 2015. Web. Foerster, Margaret. “A Note on Cummings and My Family at Silver Lake.” Spring: The Journal of the E. E. Cummings Society 6 (1997): 22-25. Friedman, Norman. “Letters from the Cummingses to Ruth Shackford.” Spring: The Journal of the E .E. Cummings Society 6 (1997): 18-21. Friedman, Norman and David V. Forrest. “Our Trip to Silver Lake.” Spring: The Journal of the E. E. Cummings Society 6 (1997): 9-17. Pfeffer, W. Tad. The Hand of the Small Town Builder: Summer Homes in Northern New England, 1876-1930. Boston: David R. Godine, 2013. Qualey, Elizabeth Cummings. When I Was a Little Girl. Ed. Carlton C. Qualey. Center Ossipee, NH: Carroll County Independent, 1981. Stevens, Peter. “Sam Ward.” Cummings at Silver Lake, Friends of Madison Library, April 2015. Web. Wilkins, David G. and FOML. “Madison Historical Society: The Cummings Family Collection at the Madison Historical Society.” Cummings at Silver Lake, Friends of Madison Library, April 2015. Web.